Hi guys! Rebecca from Aphrodite Lacquers send me 4 more polishes of her Romes and Jules collection, and today I have the swatches for you. I'm not feeling great, so I'll keep it short and let the pictures do the talking :) Here they are! 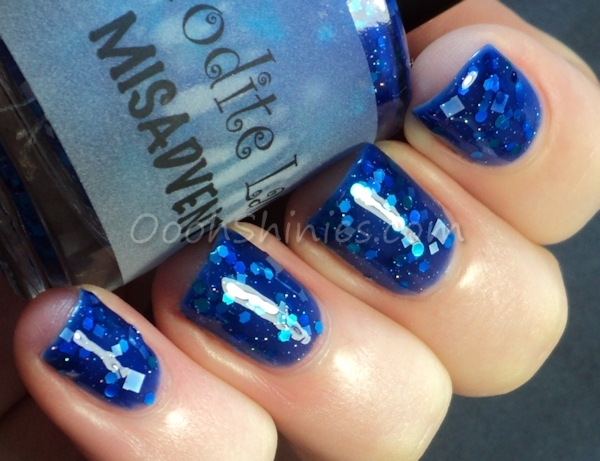 Blue base with various sizes and colors round, square and hexagonal glitter, and tiny holographic sparkle as well. 3 coats with top coat. 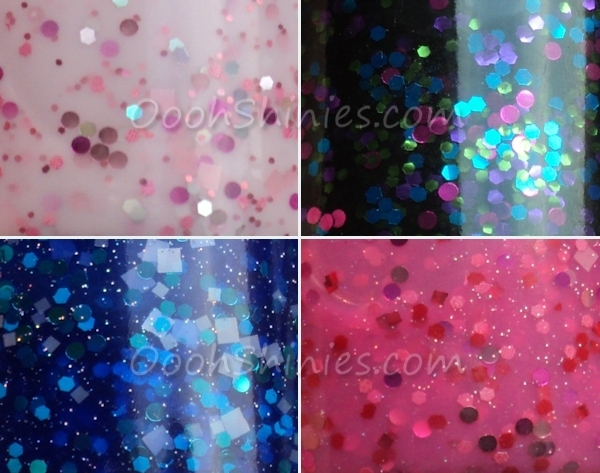 Round pink glitters and different sized hexagonal glitters in blue, green and purple in a black base. The colors are much brighter irl! I wasn't sure if I would get this fully opaque (although I must say I didn't try it yet either *edit, you can get it opaque with 3 coats*), so I layered it straight away. 1 medium thick coat on black, finished with top coat. This looks like a pink version of Misadventure, it's a pink base with various sizes and colors round, square and hexagonal glitter, and it also has the tiny holographic glitter. 3 coats with top coat. A pale, light pink base with a subtle pink shimmer (more visible irl) and various sizes & colors round, square and hexagonal glitter. This one has larger as well as smaller hexagonal holographic glitters. 3 coats with top coat. 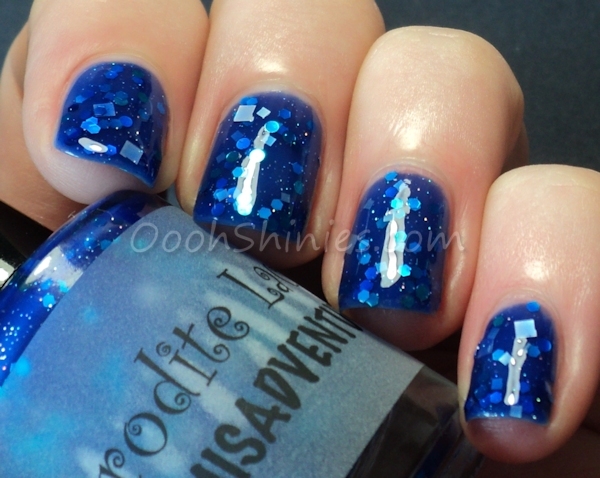 They all applied nice, the first coat didn't give much glitter on the nail if I just polished (instead of dabbing it on more), but after that they build up easily on that first coat. And as you could see with Montagues, they work great as layering polish as well. You can buy these polishes in Aphrodite Lacquer's Etsy shop, and you can find AL on Facebook as well.